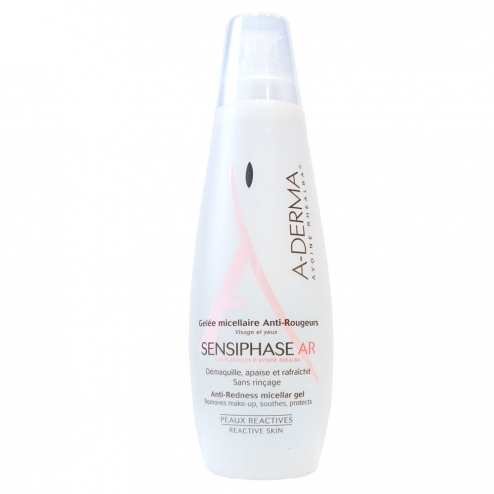 Jelly Anti Redness micellar Sensiphase AR cleanses, soothes and refreshes reactive skin prone to redness or point installed. Morning and evening, apply without rubbing on the face and eyelids with a cotton pad or fingertips. Does not require rinsing. Formula INCI: Aqua, PEG-4 Glycerin, Hamamelis virginiana (witch hazel) leaf water, bis-PEG-18 methyl ether dimethyl silane, Acrylates/C10-30 alkyl acrylate crosspolymer, avena sativa (oat) leaf / stem extract, BHT, coco glucoside, disodium cocoamphoacetate, methylparaben, phenoxyethanol, propylene glycol, sodium chloride, sodium hydroxide, sodium methylparaben.